This tried-and-true, family-favorite recipe for Peanut Butter Milk Dud Cookies is sure to be a hit for you too! Start with peanut butter cookie dough, then wrap it around a Milk Dud, roll the cookie in sugar and bake. Warm and chewy caramel and melty chocolate combined with peanut butter, what could be better? We think these easy Milk Dud stuffed cookies are best served warm from the oven and maybe even better yet with a scoop of vanilla ice cream. This recipe calls for butter-flavored shortening, but feel free to substitute regular unsalted butter in equal proportions. For best results, use butter that has been warmed to room temperature. In a large mixing bowl, cream the shortening, peanut butter, 1 1/2 cups sugar and brown sugar until light and fluffy. Gradually add the dry flour mixture to the peanut butter mixture and mix well. Chill cookie dough for at least one hour. When you're ready to shape the cookies, preheat oven to 350F degrees. Line cookie sheets with parchment paper or use ungreased sheets. Shape 4 teaspoons of dough into a ball around each Milk Dud so it is completely covered. Roll the cookie dough ball in remaining sugar. Place balls at least 2 inches apart onto ungreased cookie sheets. Remove from oven and allow cookies to cool on sheets for 5 minutes before transferring to wire rack. * We highly recommend that you use the best quality peanut butter possible - generic brands and reduced-fat peanut butter is not recommended for this recipe. 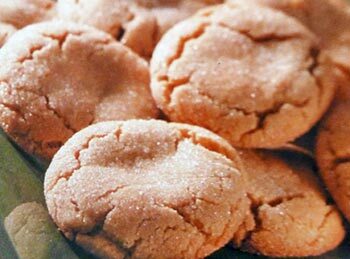 This recipe yields about 8 dozen Peanut Butter Milk Dud Cookies.